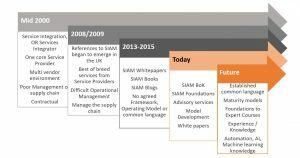 Service Integration and Management (SIAM) by no means is a new concept it’s been around for quite some time dating back to early 2000s originating from the UK. 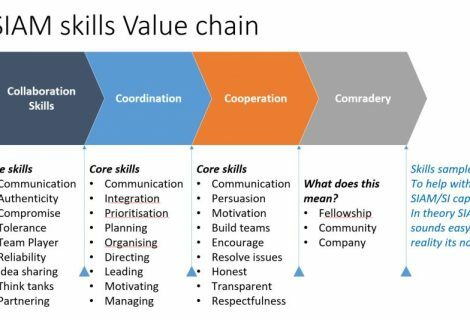 Some call it a framework, others a methodology and or an operating model. The SIAM Body of Knowledge (BoK) was published by Scopism SIAM BoK Foundation 2016, SIAM Professional 2017 respectively branded it officially as a “Management methodology.” The Boks are available online for free. References to SIAM began to emerge from the UK in the late 2000’s. 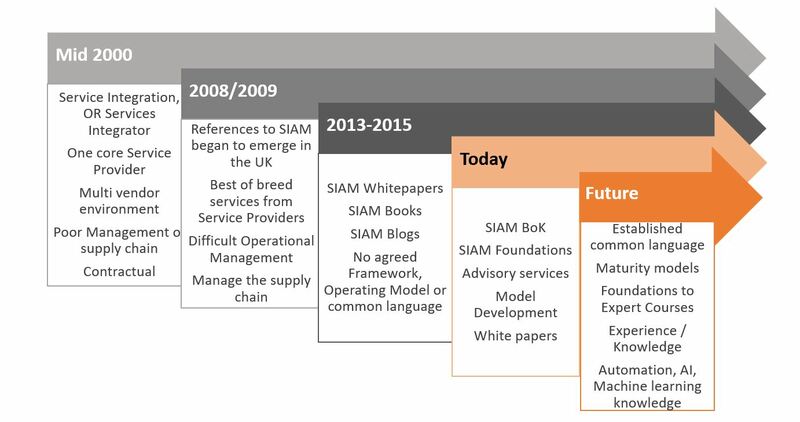 The term SIAM was predated by the term Service Integration which has been in use since at least 2008/2009. Models initially were developed by large IT service providers, including Accenture, HCL Technologies, Cap Gemini, CSC, Atos, TCS, and IBM. Moreover, Third-party advisors, notably KPMG, Gartner and ISG and others….. It is exciting to see where it ends up! If we look at the evolution of outsourcing and using external Service providers to deliver services this trend that continues to grow. Some delivered Cloud services, others SAP, EUC and so on. They were specialists in their fields. We essential created our issues on how to now manage multiple providers. 10yrs Multi-vendor mgmt. Models became the ideological way to manage providers. As Outsourcing continues to grow, Customers are seeking authentic partnerships, true collaboration within SIAM capabilities. After all, this is the spirit and ethos it was intended to be; Cooperation, Collaboration, Coordination and innovation. Risk and reward becomes an ideal way to work; everyone is the ecosystem is rewarded for excellent teamwork. If one partner lets the team down everyone is penalised. This is yet to be established in organisations but a great way to incentive SP’s to do the right thing together. Even IT has also gone through an evolution from Adhoc IT shop to a Managed multi-vendor environment to taking on Business domains and wrapping into ITSM to deliver ESM. IT is growing up, and it still needs to change and evolve drastically. Now more than ever. 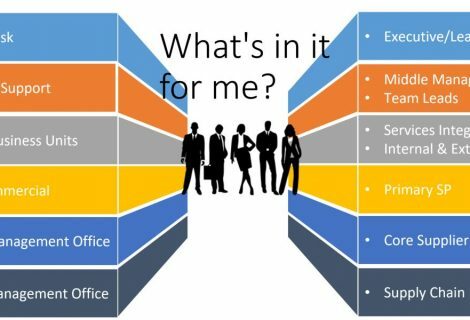 Figure 2 – where are you at with your IT Transform Journey? The above needs to ensure it does not hinder or hamper service delivery through bureaucracy, politics and absolute control. Instead, SIAM needs to foster services based culture, focusing on value and outcomes-based service delivery. As well as continual ability to improve and enhance services. There is even closer alignment between Business and IT, through strategic planning through the Business Relationship Managers (BRMS) and BRMO – business relationship management office. IT must become the trusted advisor and partner with the Business. IT and Business need to ensure governing body defining Strategy for the organisation and how IT supports and deliver this including the right operating model, integrated governance, and seamless e2e services. A Typical IT operating model may look like this (helicopter view), see figure below for high-level view it’s a sample, I am not saying you do or don’t have a model as such. IT is the gatekeeper to supplying services and meeting demand from the Business/Customer. 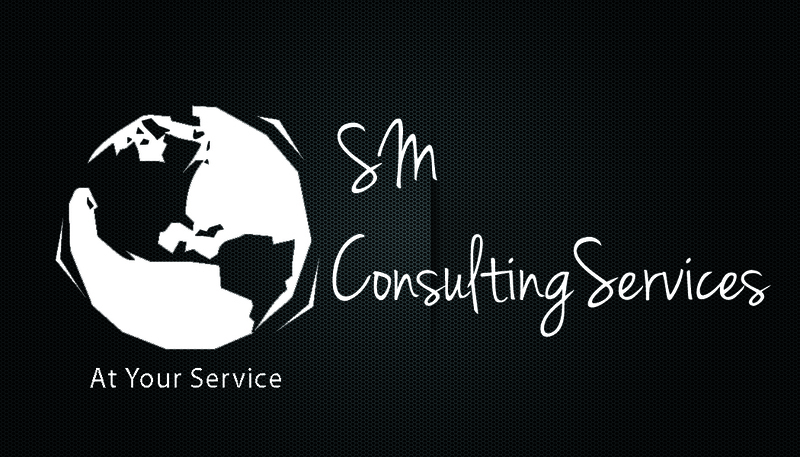 Its service desk or SMO has typically been the gatekeeper to service provider towers. A typical operating model adopted, remember it’s a simplistic helicopter view. 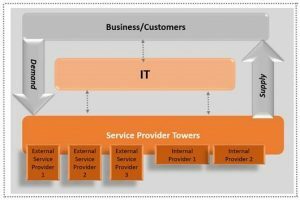 Typically Business and customers demand services and Suppliers, Vendors and or Service Providers (SP) supply these services through the retained IT organisation. Simple economics right, supply and demand relationship, and that is where the simplicity stops. IT are there either brokering services, managing or working with other IT organisations within their Operating model. Where it’s Service Integration (SI), SIAM or with Shadow IT lurking in the background. The business’ appetite and demand for services are ever increasing, and in today’s world we need plug and play Operating Models to bring Service Providers In and Out as required by the business. These are experiences and our thoughts working on SIAM over the last ten years. The things you won’t find in a book, it’ll be a series of blogs and practical activities executed that helped various organisations. Remember every journey is different, every business problem is unique to you and your organisational and business needs. The series outlines our experiences, customer issues, why they choose SIAM and more importantly the challenges faced. Of course, organisations remain anonymous to retain professionalism and of course privacy! So look out for our articles over the next few days and weeks, where we are highlighting one key challenge each week. Focusing on what we have witnessed as repeat offending topics time and time again. Stay tuned as we have years of practical experience, knowledge, success stories, battle scars and more….